In my world, vacation knitting is all about the socks. So, even though I cast on for a Baby Surprise Jacket at the beginning of the week I quickly abandoned that project for socks. 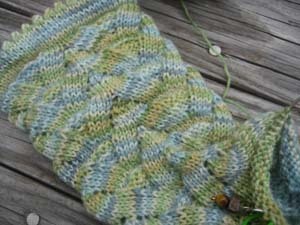 I got my groove on with plain stockinette in Claudia’s Handpaint. These were great for martini drinking, chatting, and knitting. And I monkeyed around a bit, too. These saw the most attention in the morning while everyone else was sleeping. But, that’s not all. I finished two! yes, two! pairs of socks. My old standby, feather and fan. The yarn is Cider Moon “Icicle” in the color Sweet Potato Pie. I love this yarn so much. It’s squishy and soft and the colors are fabulous. 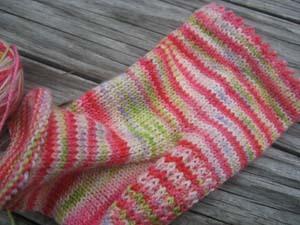 And a pair of Charade socks, too. The yarn for these was a gift from Hillary and it, too, is wonderful but I don’t think it’s available online. I still love summer the best and I don’t want to see it end, but at least when the fall arrives I’ll have some new socks to wear. Nothing better than a sock on vacation! Nice colorways and patterns. Lovely socks! They are the perfect vacation knit. All lovely socks; I especially love the colors in the last pair! 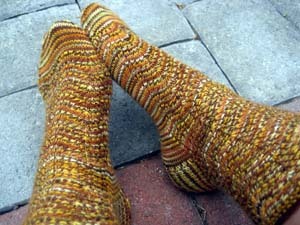 I adore that ‘Sweet Potato Pie’ colorway – I bought the fiber and spun it myself, but not thin enough for socks. I ended up 3-plying it, and it’s really gorgeous, but I only have 200 yds. Guess it’ll have to be a hat to match your socks – long-distance cousins! I’m need to try some Cider Moon. All your socks look great. Socks are perfect vacation knitting (ANY time knitting, actually). Wow…….you were a knitting machine! Over this summer, I have really found that I enjoy making socks very much…….yours are lovely! Wow, I’m impressed! My vacation knitting plans usually go by the wayside. Your socks are great! You sure know how to make the most of a vacation! Love your new socks! IVK~~Impressive Vacation Knitting!!! All the colors are fantastic! Sweet socks! I am duly impressed with the knitting mojo, mine always vanishes on vacation. Those feather & fan socks are fabulous! OMG. I MUST have Sweet Potato Pie!… It looks stunning in Feather and Fan. Lovely job on all the socks, but that one pair is heart-stoppingly beautiful. Wow! I love the “feather and fan” pattern. Where is this pattern from? I believe you made a scarf in this pattern also? “Wow” is all I can say for all the work you got done!!!! Great socks. You really made the most of your vacation. Oooh, I love those feather and fan socks. I think I’ll make those my next pair! Socks are the perfect vacation projects! Both pair are wonderful! I love the Cider Moon colorway! Did you start *and* finish those last week? If so I am totally impressed. Actually I’m totally impressed anyway. And, once again, you and I were on (almost) the same f&f cycle — that’s what I used for my sockapaloozas. Looks like a very relaxing vacation. What could be better than spending it with those we love. Three at once?! And all beautiful! Looks to me like there was plenty of martini drinking if you got that far on the Claudia socks – plus all the rest of the socks too!! All of your socks are beautiful. I particularly like the Sweet Potato Pie (feather & fan) socks. The name is really appropriate for the color! And there I was, thinking I was so impressive finishing *one* monkey sock while camping! Your socks are amazing! Nothing like socks and martinis on vacation 😉 Loving them all! Especially that Cider Moon yarn…mmmmm! Wow, you were busy! Your socks all look beautiful. Beautiful socks. You were really on a sock roll there, Carole! I agree with Beth, I want some Sweet Potato Pie, yum, yum, yummy! All your socks look great! Well you certainly have been busy. Lovely socks you have and they look like perfect projects for vacation. 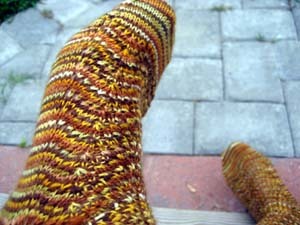 oh.. love me those Cider moon feather/fan socks…. divine. 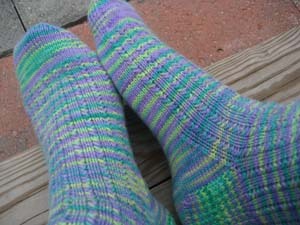 I guess that I’d better get my fingers in gear knitting up socks for the fall, I’m way behind! 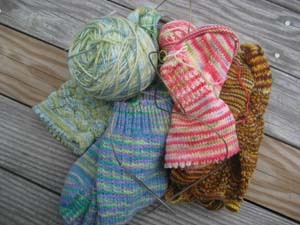 I absolutely ADORE the colors you picked for your monkey socks! You were really productive too! Now…. remind me… are you coming for a whole week in September, or just for the a long weekend? Gorgeous colors, all! You’ve got some seriously fancy feet going there, girl. 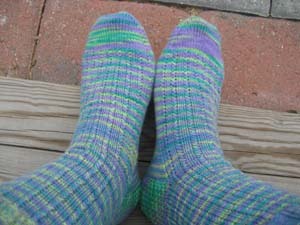 You are in your sock glory, after a spate of vacation knitting…. you are right, it is tough to see summer starting to slip away but at least a large wool sock collection will be a consolation. Great socks! All of them are lovely, but that feather and fan pair makes me swoon. FABULOUS socks! You & I would vacation well together. Your IP address reveals your point of entry to the Internet and can be used to trace your communications back to your ISP, your employer’s network, your school, a public terminal.